Parking lots for the Sue & Frank Mayborn Performing Arts Center are located off of Martin Luther King, Jr. Avenue next to the Paul & Jane Meyer Christian Studies Center and the Davidson Building. The Baugh Performance Hall provides on-campus performance space for opera, musical theater, and theater productions. The 524-seat theater with a proscenium stage and fly space accommodates the requirements of a dramatic production, complete with orchestra. Shared inventory with other venue. Availability contingent upon event scheduling. 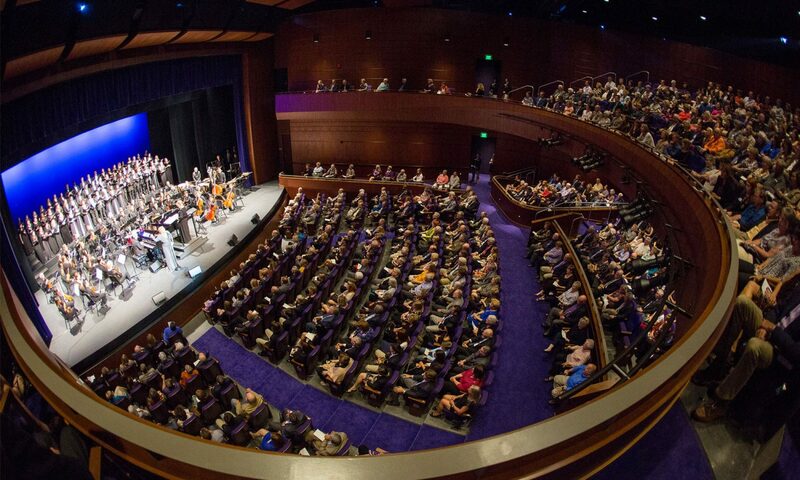 As one of the premier venues within the Sue & Frank Mayborn Performing Arts Center, the Fikes Chamber Hall is an intimate 2,000-square-foot performance space utilizing flexible seating options and versatility. The room is used for concerts and recitals, as well as a reception space for social gatherings. 30 – 3’ x 6’ risers available in 1’, 2’, 3’, 4’, & 5’ heights available for seating area. Adaptable based on seating arrangements and production needs. The Paul & Jane Meyer Rehearsal Hall serves as both a classroom and a rehearsal space for theatrical and musical productions. The room’s dimensions mirror the dimensions of the stage in the nearby performance hall so that students are able to practice for upcoming productions there as easily as on the stage. Vending machines are located near the Paul & Jane Meyer Rehearsal Hall. Additional restroom space and showers are located in the bathrooms across the hall from the dressing room areas. The Scene Shop plays a critical role in the production process of any performance. Starting with set design, students and staff move into the fabrication and construction phase where the design concepts become reality. Equipped with top-of-the line features, the scene shop offers a unique and thorough experience to the students, faculty, or staff working behind the scenes. The Sue & Frank Mayborn Performing Arts Center features a recording studio which provides the perfect environment in which to learn and fine-tune skills such as music producing, recording (both in studio and live settings), editing, mixing, mastering, dubbing, engineering, and more. Students have access to an array of state-of-the-art equipment in a control room setting. The premiere choral ensemble at UMHB, Concert Choir is open to all students by audition. Current membership represents a variety of disciplines including Music, Christian Studies, Nursing, Business, Sociology and Computer Science. University Singers is a large choir open to singers of all levels, performing both contemporary and traditional literature. The pride and joy of UMHB, One Voice is an auditioned choral ensemble that represents UMHB in churches, schools and civic functions throughout the state and nation. Wind Ensemble is the premier instrumental ensemble open to any UMHB student by audition, regardless of major. 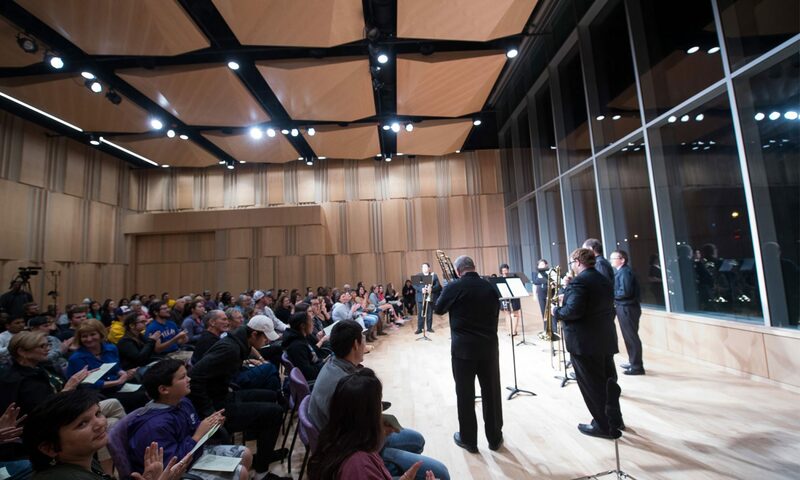 Repertoire is selected to expose performers to a wide range of musical languages, as well as a variety of technical, intellectual, and aesthetic challenges. The UMHB Wind Ensemble performs 3-4 concerts each semester. Jazz Ensemble plays a widely varied repertoire including styles of music from Duke Ellington to the contemporary artists of today. A strong emphasis is placed on sight-reading. The group is open to all university students, regardless of major. The ensemble performs 3-4 times per year, including festivals and community concerts. The UMHB OPERA is designed to train, develop and prepare for a professional career in opera. The UMHB OPERA produces one fully staged opera per academic year. This annual production includes a professional orchestra, costumes, lighting, sets and props. The UMHB Musical Theatre is very rigorous. The annual production is mounted in the fall and requires a great deal of preparatory work for the student performer. This annual production includes a professional orchestra, costumes, lighting, sets and props. It is designed to give an opportunity to perform Musical Theatre to anyone on campus. The UMHB Musical Theatre produces one fully staged production per academic year. Monday-Friday, 1 pm - 4 pm and one hour prior to curtain on all ticketed events.